Gabe Brown, a nationally-recognized innovator of cover crop cocktails in no-till grain and livestock production systems, will be in the western NC region this March, as part of a partnership between Living Web Farms in Mills River, NC, and the Organic Growers School’s (OGS) 24th Annual Spring Conference, March 10-12, 2017, at UNC-Asheville and in Mills River, NC. During this rare visit to the Southeast, Gabe will share what he has learned over the 20+ years that he has worked to decrease costs and increase income on his 5000 acre farm by building soil health and diversifying production. No stranger to producing profitable grain crops and cattle in highly variable weather, Gabe has more than 30 years of experience farming just outside of Bismarck, North Dakota in a region defined by intense weather challenges created by winter storms, extreme heat and cold, severe thunderstorms, drought and flooding rains. 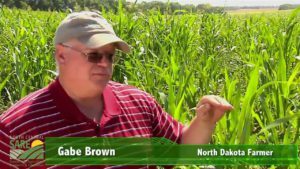 Gabe faced his most difficult management challenge in the mid 90’s when he was refused an operating loan after four years of back to back crop losses due to extreme weather. With no money to purchase fertilizers or pesticides for the new season, Gabe had to decide to quit farming or to search for another way to continue farming in the face of increasingly variable weather and extremes. Gabe learned about holistic management, a way of farming that makes it easier for producers to take advantage of the many benefits – such as increased drought resistance and reduced fertilizer and pesticide needs – associated with healthy soils, more diverse crop rotations, and planned livestock grazing and he started right away to make changes on his farm. Gabe is a popular speaker at farming conferences throughout the country and regularly hosts more than 2000 visitors each year for tours and workshops at his farm. He has also collaborated with university and federal scientists to conduct soil quality research on his land. His management techniques and crop production practices are widely applicable and have proven successful in a wide range of climates and cropping systems, including North Carolina. Hedrick has become a leader in his own farming community since his introduction to ecological farming. “I haven’t used any herbicides or pesticides on my land for four years. I would say that here in North Carolina we have an incredible opportunity to implement these principles. We have an even longer growing season than Gabe does. If we can grow more cover crops, produce more biomass, why would we not take advantage of that opportunity? Anyone who tells you we can’t do this in NC, tell them I got higher yields with 60% less fertilizer.” Hedrick has truly convinced himself, and his neighbors it seems, that he can not only rejuvenate the land, but also increase profits and grow quality products. Gabe’s innovative approach to crop and livestock production has been nationally-recognized with a number of awards over the last decade, including the National Cattlemen’s Beef Association’s Environmental Stewardship Award (2006), USA Zero-Till Farmer of the Year (2007), Honor Award from the Soil and Water Conservation Society (2008), and the Food Producer’s Growing Green Award (2012). Gabe was a featured speaker at the 2014 National Cover Crop and Soil Health Conference, a landmark event that brought together three hundred agricultural leaders and innovators to explore how to enhance the sustainability of American agriculture through improved soil health. Laura Lengnick, an Asheville-based author and climate resilience expert, featured Gabe in her 2015 award-winning book Resilient Agriculture: Cultivating Food Systems for a Changing Climate. Organic Growers School and Living Web Farms are bringing Gabe Brown to the Southeast in an effort to raise awareness about the importance of soil health and bring educational resources to the growers in our region. “A farm of any size can implement zero till, diverse crop rotations, cover cropping, and animal integration systems into their farm for both long-term economic and soil building results,” says Meredith Leigh of Living Web Farms, one of the sponsoring organizations of Gabe Brown’s visit. Keynote Address, Saturday, March 11, 2017 at the OGS Spring Conference, UNC-Asheville. At Brown’s Ranch, we regenerate landscapes. 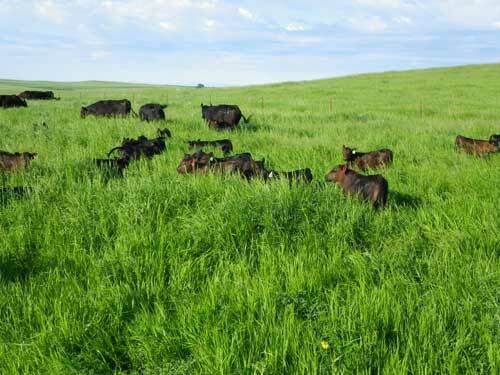 We do that through the practice of Holistic Management and by farming and ranching in nature’s image. Improving soil health is a priority and no-till farming has been practiced since 1993. As a result, all aspects of our farm are thriving. We have eliminated the use of synthetic fertilizers, fungicides, and pesticides. We use minimal herbicide and are striving to eliminate it. We do not use GMOs or glyphosate. This results in increased production, profit, and a higher quality of life for all of us. We are moving towards sustainability for not only ours but future generations as well. Join Gabe Brown as he shares the inspiring journey from conventional farming to solving problems in a natural and sustainable way. Discover the production methods and implementation techniques for healthy soils which will increase yields and decrease chemical and machinery costs. Includes minimizing soil disturbance, keeping soil covered, maximizing diversity, keeping living roots in the soil, and using animal integration. The 24th Annual Spring Conference, for farmers, gardeners, homesteaders, and sustainability seekers, is hosted by Organic Growers School (OGS), a local non-profit organization, and will take place Saturday and Sunday, March 11 & 12, 2017, at UNC-Asheville, in Asheville, North Carolina. Pre-Conference workshops will be held on March 10th. The Spring Conference offers practical, regionally-appropriate workshops on farming, gardening, permaculture, urban growing, and rural living plus a trade show, seed exchange, silent auction, children’s program, and pre-conference, on-farm events. There are more than 70 one-and-a-half hour sessions per day in these themed tracks: Community Food, Cooking, Earthskills, Farmer Beginning, Farmers Intermediate/Advanced, Gardening, Herbs, Livestock, Mushrooms, Permaculture, Pollinators, Poultry, Soils, Sustainable Forestry, Sustainable Living, and More! For more information and to register, go to: www.organicgrowersschool.org, or request a mailed registration form Rodney Bowling, rod@organicgrowersschool.org or (828) 680.0661. Registration forms are also available at area retail stores and Cooperative Extension offices.